Ahh the wonderful world of acids - well, maybe not for everyone. Acids are fickle beings, and when mixing them with skincare you can really get yourself into trouble - damaging your skin barrier with over-exfoliation. I've been using alpha hydroxy acid (aha) and beta hydroxy acid (bha) for over a year (bha, or salicylic acid, for about 15 years actually), but have backed down a bit since incorporating tretinoin into my routine. 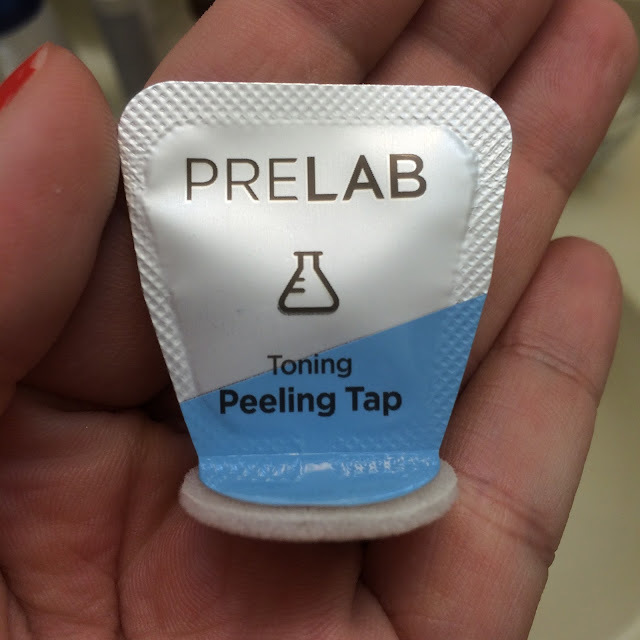 I recently discovered the Prelab Toning Peeling Tap on Memebox USA, and thought it might be a more gentle option for incorporating acids into my skincare routine without thinning or over-exfoliating my skin. The Prelab Toning Peeling Tap is a gentle exfoliating essence that uses fruit enzymes and plant extracts to purify and moisturize the skin. 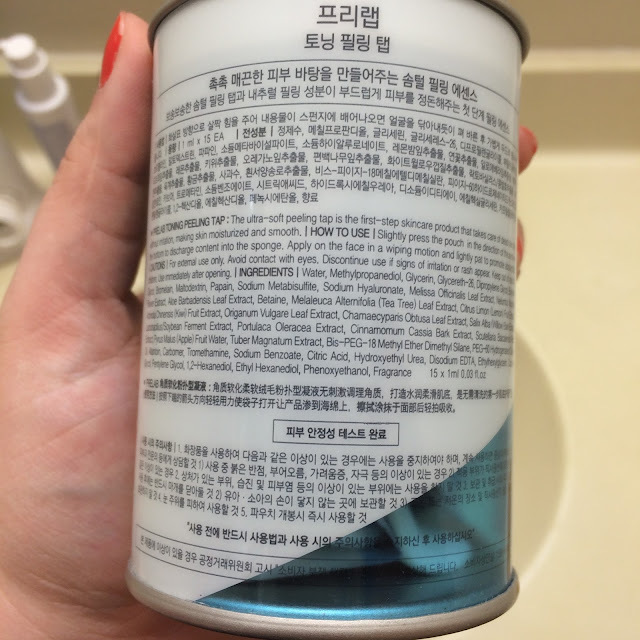 Ingredients: Water, methylpropanediol, glycerin, glycereth-26, dipropylene glycol, butylene glycol, bromelain, maltodextrin, papain, sodium metabisulfite, sodium hyaluronate, melissa officinalis leaf extract, nelumbo nucifera flower extract, aloe barbadensis leaf extract, betaine, melaleuca alternifolia (tea tree) leaf extract, citrus limon (lemon) fruit extract, actinidia chinensis (kiwi) fruit extract, origanum vulgare leaf extract, chamaecyparis obtusa leaf extract, salix alba (willow) bark extract, lactobacillus/soybean ferment extract, portulaca oleracea extract, cinnamomum cassia bark extract, scutellaria baicalensis root extract, pyrus malus (apple) fruit water, tuber magnatum extract, Bis-PEG-18 methyl ether dimethyl silane, PEG-60 hydrogenated castor oil, allantoin, carbomer, tromethamine, sodium benzoate, citric acid, hydroxyethyl urea, disodium EDTA, ethylhexylglycerin, caprylyl glycol, pentylene glycol, 1,2-hexanediol, ethyl hexanediol, phenoxyethanol, fragrance. The packaging consists of a plastic jar with a tin lid, that contains 15 cushion pads with a foil packet behind it. 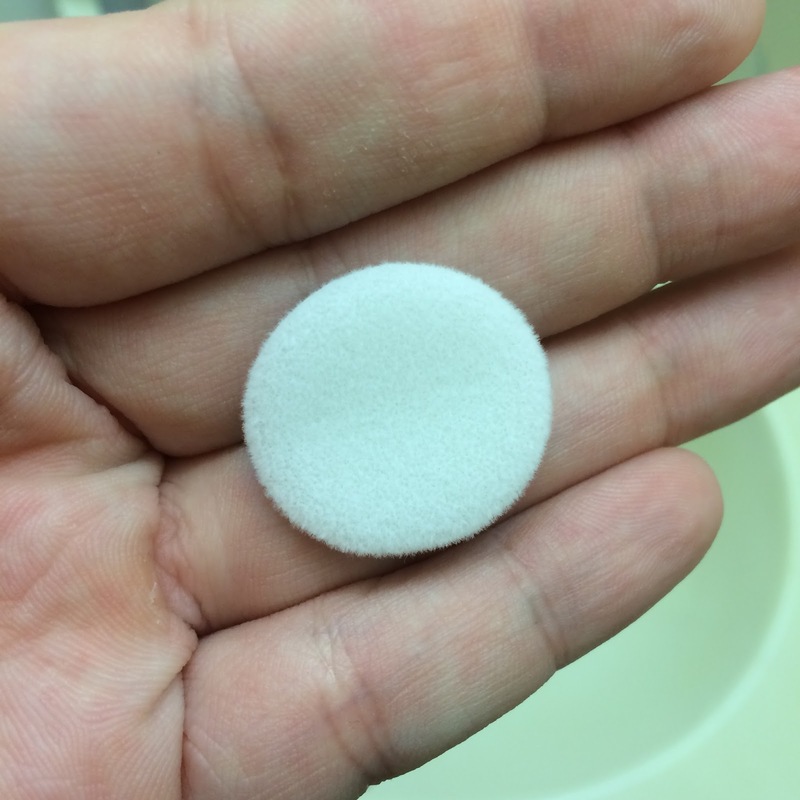 The "peeling" solution is in the foil, and when you're ready to use one you simply push the foil to create enough pressure for the solution to break through and absorb into the pad, so you can wipe it onto your face. It's a very simple process, and so easy to use at home or during travel. The essence is seemingly scentless - and a thicker serum consistency. It's easy to wipe onto the skin holding the foil, I usually massaged using tiny circular motions and found this gave me even application. 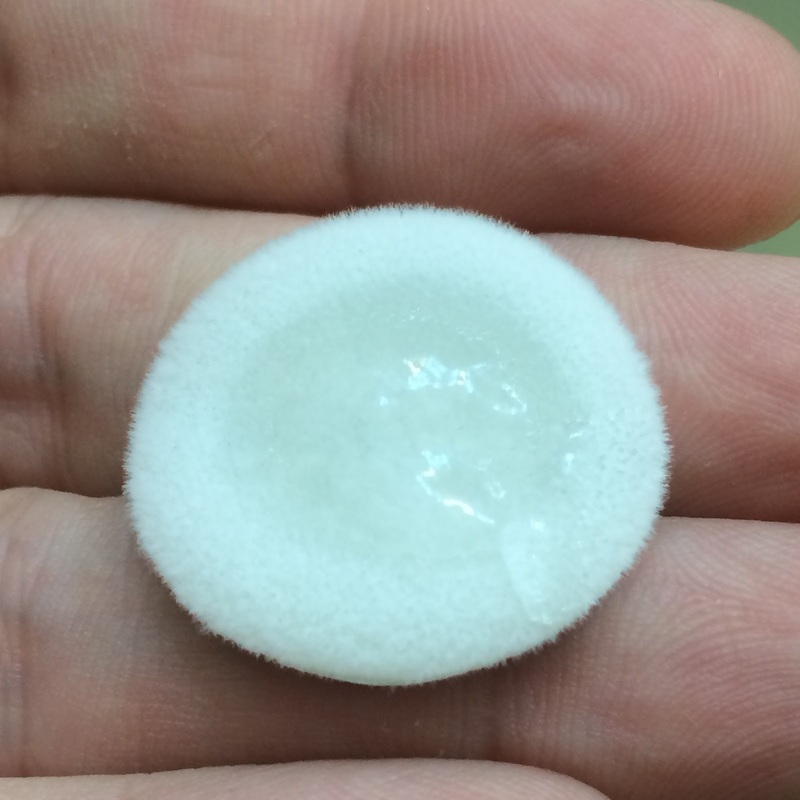 It only took a minute for the essence to absorb into my skin, and it was not irritating at all. 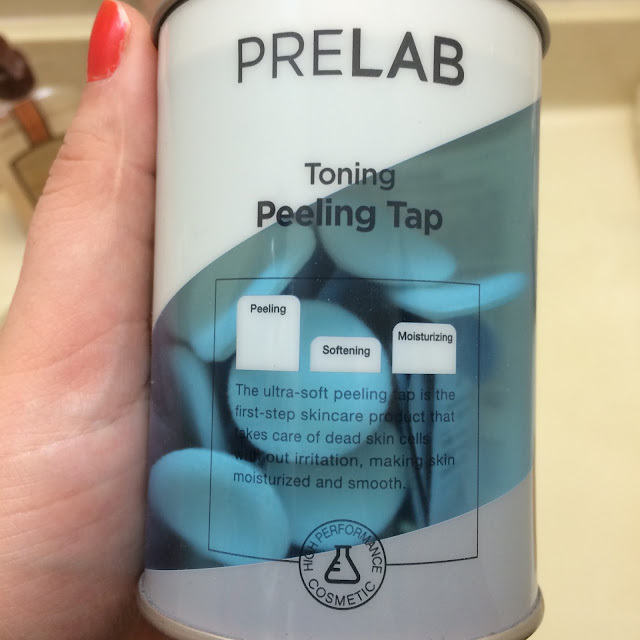 I used the Prelab Toning Peeling Taps for 2 weeks (one each evening) and found this to be a very gentle alternative to traditional chemical exfoliants. I personally feel that these tabs did a nice job keeping my pores and skin clear and clean while using them daily, along with my tretinoin prescription. Much more gentle that using my usual AHA and BHA and in no way drying or irritating to my skin. You can find this product on Memebox USA*. If you've never purchased from Memebox before, you can save 20% by making an account and purchasing through my referral link*. I have never heard of this type of skin treatment before!! Sounds like a great way to treat problem areas of your skin. They make it really easy to apply. This is definitely worth giving a shot, I think! I had never heard of a beauty product like this before. Saving 20% is an awesome incentive! Every time I've tried something like that, I end up peeling for days. Glad to hear you had good success! I've never heard of a peeling tap before. Is it the same thing as a toner? It's an "active" step that comes after a toner =) It contains mild organic forms of alpha hydroxy acid and beta hydroxy acid. I have done a whole lot of peels, but this is intriguing me. 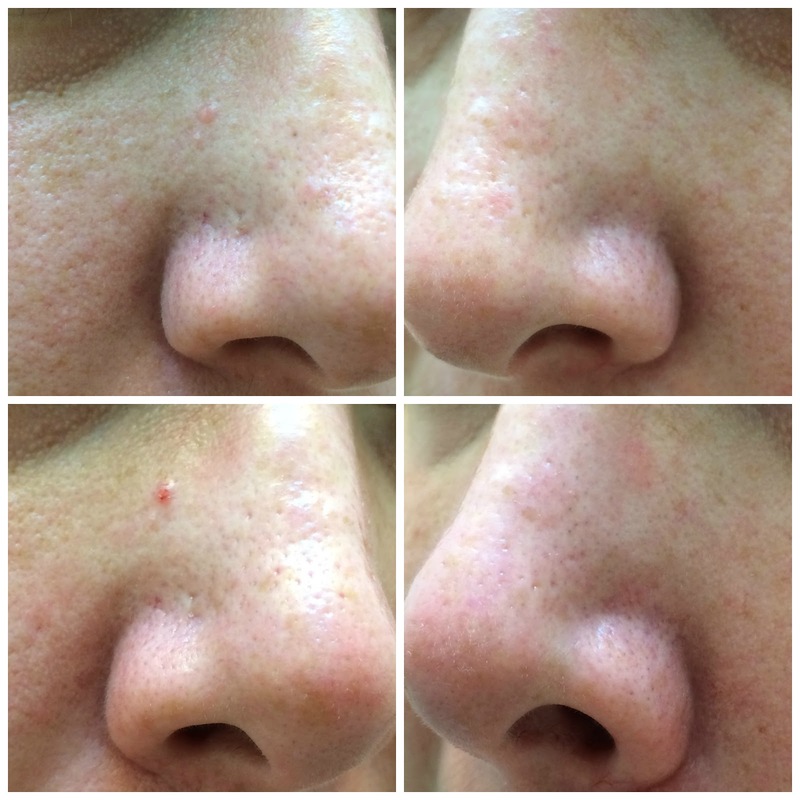 I would love to try it to see what it can do for my skin. It's pretty genius to put your product in a tab like this. You don't have to wonder if you're using too much or too little of a product; the perfect amount is right there. This definitely looks worth a try! I saw this at Memebox but didnt know what it was. Thank you for this review.